Well would you believe it ? I'm parked outside the cafe. My immersion heater seems to be following the latest trend . . and has died. On the bright side, the electrical problem on the B33 is now sorted . . .earth fault. Tuesday - spent most of today picking up the paperwork and booking the funeral for my Aunt - looks like it will be on Monday, November 10th. Wednesday - went and registered my Aunt's death - then spent the rest of the day sorting out my immersion heater. Thursday and I did a little more fettling with the immersion heater - all sorted now. Friday morning and I sorted an electrical problem out on Tracy's Fazer - Friday afternoon was spent sorting my Aunt's affairs out. I had Saturday off ! 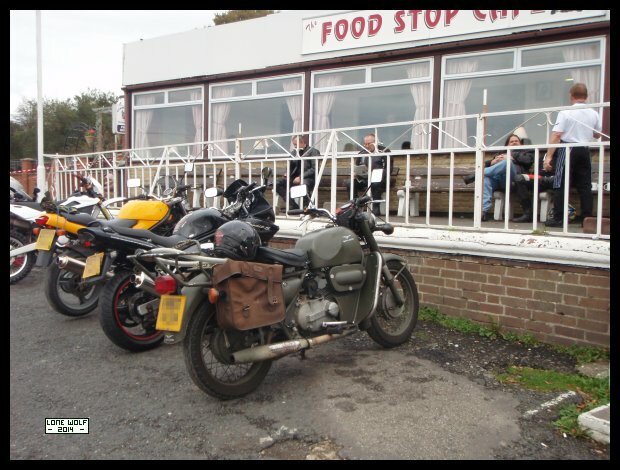 Sunday and the Guzzi went for dinner down the cafe. A video can be seen HERE.